This page Yin and yang is part of the Eastern religions cycle. Yin and yang, ☯, is a circular symbol consisting of a white and black droplet, representing the fusion of the concepts of yin and yang. In Chinese philosophy, the concept of yin-yang , which is often called "yin and yang", is used to describe how seemingly opposite or contrary forces are interconnected and interdependent in the natural world; and, how they give rise to each other as they interrelate to one another. Many natural dualities (such as female and male, dark and light, low and high, cold and hot, water and fire, life and death, and so on) are thought of as physical manifestations of the yin-yang concept. The concept lies at the origins of many branches of classical Chinese science and philosophy, as well as being a primary guideline of traditional Chinese medicine, and a central principle of different forms of Chinese martial arts. Yin and yang are actually complementary, not opposing, forces, interacting to form a whole greater than either separate part; in effect, a dynamic system. Everything has both yin and yang aspects, (for instance shadow cannot exist without light). Either of the two major aspects may manifest more strongly in a particular object, depending on the criterion of the observation. The concept of yin and yang is often symbolized by various forms of the Taijitu symbol, for which it is probably best known in Western cultures. There is a perception (especially in the Western world) that yin and yang correspond to evil and good. However, in Taoist metaphysics, good-bad distinctions and other dichotomous moral judgments are perceptual, not real; so, yin-yang is an indivisible whole. 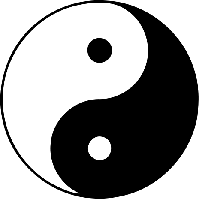 In the ethics of Confucianism on the other hand, most notably in the philosophy of Dong Zhongshu, (Template:Circa 2nd century BCE) a moral dimension is attached to the yin-yang idea. Yang is the white side with the black dot on it, and yin is the black side with the white dot on it. The relationship between yin and yang is often described in terms of sunlight playing over a mountain and a valley. Yin (literally the 'shady place' or 'north slope') is the dark area occluded by the mountain's bulk, while yang (literally the 'sunny place' or 'south slope') is the brightly lit portion. As the sun moves across the sky, yin and yang gradually trade places with each other, revealing what was obscured and obscuring what was revealed. Unless indicated otherwise, the text in this article is either based on Wikipedia article "Yin and yang" or another language Wikipedia page thereof used under the terms of the GNU Free Documentation License; or on original research by Jahsonic and friends. See Art and Popular Culture's copyright notice. This page was last modified 09:49, 9 October 2013.